June 27, 2016 Toronto, ON: Cineplex Events, Live Alliance, Eagle Rock Entertainment and Tenth Street Entertainment will give music lovers a chance to see the final concert from legendary rock artists, Motley Crue, in a one-night only event on July 11, when they premiere Mötley Crüe: The End in key theatres across Canada. On December 31, 2015, legendary rock icons Mötley Crüe completed their 35-year touring career as a band with a spectacular final concert at Staples Center in their hometown of Los Angeles, CA, just 10 miles from the Sunset Strip where the band’s infamous and decadent career first launched. The band thrilled the sold-out arena with performances of such mega-hits as “Kickstart My Heart,” “Girls, Girls, Girls,” “Home Sweet Home” and “Dr. Feelgood.” While not everyone was able to see their Final Show live, Crüe fans can now catch all the action on the big screen. In addition to the epic concert footage, cinema audiences will be treated to behind-the-scenes footage of the band’s last show ever. Please see local listings for showtimes. About Fathom Events Fathom Events is the event cinema distribution arm of AMC Entertainment Inc. (NYSE: AMC), Cinemark Holdings, Inc. (NYSE: CNK) and Regal Entertainment Group (NYSE: RGC) (known collectively as AC JV, LLC), the three largest movie theater circuits in the U.S., and is recognized as the leading distributor of alternative content. It offers a variety of one-of-a-kind entertainment events in movie theaters nationwide that include live, high-definition performances of the Metropolitan Opera, dance and theatre productions such as the Bolshoi Ballet and National Theatre Live’s Hamlet, sporting events like FS1 Presents USA v Mexico, concerts with Roger Waters and One Direction, the TCM Presents classic film series and faith-based events such as The Drop Box and Four Blood Moons. Fathom Events also takes audiences behind the scenes and offers unique extras including audience Q&As, backstage footage and interviews with cast and crew, creating the ultimate VIP experience. In addition, Fathom Events’ live digital broadcast network (“DBN”) is the largest cinema broadcast network in North America, bringing live and pre-recorded events to 885 locations and 1,348 screens in 181 Designated Market Areas® (including all of the top 50). For more information, visit www.fathomevents.com. About Live Alliance Having recently produced the most successful concert pay per view live event of all time, Grateful Dead’s Fare Thee Well summer reunion shows, Live Alliance is the leader in live event distribution across all platforms, including theaters, cable, satellite and digital PPV distribution and linear broadcasting. Live Alliance provides top tier video production and distribution for concert films for broadcast and online live events. Working in the live concert film space for 10 years, the founders of Live Alliance were the team behind one of the very first companies to stream large scale events over the internet. Live Alliance is a pioneer in the industry and has grown to provide broadcast and technology for hundreds of clients – working with some of the biggest artists and platforms throughout the world. About Tenth Street Entertainment: Tenth Street Entertainment is a full service brand and entertainment company, representing some of the most exciting acts in music today. Founded in 2006 by Allen Kovac, CEO of Eleven Seven Music Group, Tenth Street Entertainment embodies a multifaceted media organization that is dedicated to its clients’ needs in this evolving environment. With a structured staff and offices in New York, Los Angeles, and London, the company is hands-on in its approach to selling, marketing, promoting, merchandising, and adding value to artists’ content. Combined efforts with radio promotion, marketing, publicity, new media, tour production, management, merchandising, branding, international, and licensing ensure that the clients are always connected to their target audiences. Tenth Street Entertainment’s client list boasts a wide range of artists including Mötley Crüe, Blondie, Nelly Furtado, Five Finger Death Punch, Sixx: A.M., Macy Gray, All That Remains, Rooney, Papa Roach and many more. Managed by Tenth Street Entertainment, the artist roster has seen major success on the Billboard and all major global charts, worldwide press coverage, and extensive, creative campaigning. 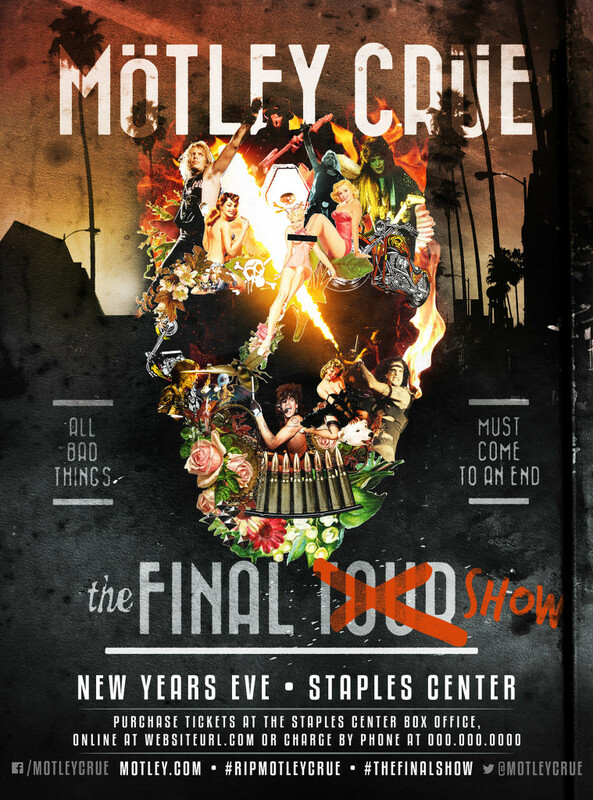 LOS ANGELES, CA December 30, 2015—Iconic, veteran rockers MÖTLEY CRÜE will play their final two shows of their thirty-four-year-long-career tonight and tomorrow at Staples Center in their hometown of Los Angeles. To celebrate their mark in rock music’s history and in honor of their devoted fans, the band announces a full length concert film of the final performance, which will also include exclusive interviews and behind-the-scenes footage of the last week of the tour, to be released in 2016! After thirty-four years performing together, the Final Tour has seen the band perform all across the globe, visiting an impressive 5 continents since July 2014 (North America, South America, Europe, Australia and Asia) for a total of more than 164 shows. Fans alike will be able to enjoy and/or relive the spectacular and cutting edge production elements of the Final Tour, such as Tommy Lee’s “Cruecifly” drum roller coaster, Nikki Sixx’s fire spitting bass performance, along with all the fan-favorite hits! Christian Lamb has been tapped to direct the concert portion of the film, while Jeff Tremaine, creator of the Jackass series, is confirmed to direct the documentary segment. Produced and distributed by Live Alliance, the film will premier in theaters worldwide, as well as via Pay Per View in all cable/satellite/digital formats. To receive more information and updates on the film’s release please head to http://motleycrue.fanbridge.com/ or http://motley.com/ to sign up for the mailing list. ABOUT MÖTLEY CRÜE Hailing from Los Angeles, CA, the quartet—Vince Neil (vocals), Mick Mars (guitars), Nikki Sixx (bass) and Tommy Lee (drums)—has commandeered the rock pantheon for over 30 years. In that time, they have accumulated worldwide album sales exceeding 80 million, seven platinum or multi-platinum albums, 22 Top 40 mainstream rock hits, six Top 20 pop singles, a star on the Hollywood Walk of Fame, three Grammy nominations, four New York Times bestsellers (including the band’s biography, THE DIRT) and countless sold out tours across the globe, playing to millions of fans. Mötley Crüe was the first rock band in history to have completed an epic sold-out Las Vegas residency at The Joint at Hard Rock Hotel & Casino. The band continues to remain on the forefront of entertainment reinventing themselves via not only their music but also their mind blowing live shows featuring never seen before elements, such as Tommy Lee’s 360 drum roller coaster. Mötley Crüe was featured in KIA MOTORS’ award winning 2012 Super Bowl commercial. After thirty-four years performing together, the 2015 leg of Final Tour has included shows all across the globe. Mötley Crüe first announced plans for their two year Final Tour by signing a ‘Cessation Of Touring Agreement’ at a press conference in Los Angeles, CA in January 2014, solidifying the end of their distinguished touring career on December 31, 2015. The Crüe’s final show will take place in the band’s hometown in Los Angeles on New Year’s Eve, bringing the curtain down on the touring career of the World’s most notorious rock band! New York, NY (July 23, 2015) – Iconic rock band Mötley Crüe has set out on the last leg of their two-year Final Tour cycle igniting the “Countdown To Crüe Year’s Eve” with a packed house at the sold-out Matthew Knight Arena in Eugene, Oregon last night. The band’s touring career will conclude for good in less than six months on New Year’s Eve, December 31 at Staples Center in their hometown of Los Angeles, the city where the band’s career began 34 years ago. After thirty-four years performing together, the 2015 leg of the Final Tour includes shows all across the globe. September will see the band perform their final Mexico shows and also take them to Brazil one last time to play Rock In Rio before embarking on their last ever European dates in November and returning to Canada and the US for dates leading into Christmas and the very final show on New Year’s eve. By the end of 2015, The Final Tour will have visited an impressive 5 continents since July 2014 (North America, South America, Europe, Australia and Asia) for a total of more than 164 shows. Mötley Crüe first announced plans for their two year Final Tour by signing a Cessation Of Touring Agreement at a press conference in Los Angeles in January 2014, solidifying the end of their touring career for December 2015. Since the announcement the band has been touring tirelessly to say goodbye to fans around the world including Japan, Australia and New Zealand earlier this year. European Final Tour Dates Announced! London 9th June 2015 – One of the most legendary and iconic rock bands to ever grace the world of music, Mötley Crüe, have made their last tour announcement ever today when they revealed the cities of their Final European Tour to take place this November. The European dates are part of the band’s 2-year ‘Final Tour’ cycle that will culminate at Staples Center on December 31st in the band’s hometown of Los Angeles, CA for their final show ever. The November tour dates will be the ultimate farewell to the European continent as Mötley Crüe will be bringing over their biggest production and pyro show to date including Nikki Sixx's flame throwing bass and Tommy Lee’s “Crüecifly” drum coaster, as well as the “Crüesnest” where fans can sit with the band up close and personal during the grand finale of the show. Check out highlights from Mötley Crüe’s show here. Speaking on their final ever European tour announcement, bassist Nikki Sixx said: "We're excited to come back to Europe with all the songs, bells and whistles and say goodbye during The Final Tour to the greatest fans in rock n roll." Motley Crue Fan Club presale tickets and VIP Packages go on presale beginning 10th June in select markets. For VIP Packages go to http://motleyvip.com. To join the fan club go to http://fanclub.motley.com. After thirty-four years performing together, the 2015 leg of the Final Tour includes shows all across the globe. Mötley Crüe have just finished a tour of Australia and New Zealand in May for their last ever shows there after concluding their final Japan run this past February. The band are currently saying farewell to the European festival circuit having just laid waste to Sweden Rock Festival this past weekend and with two massive performances coming up this weekend at Novarock Festival in Austria and at Download in the UK before taking their can’t-miss show back to the U.S., Canada, and Mexico. About MÖTLEY CRÜE Hailing from Los Angeles, CA, the quartet—Vince Neil (vocals), Mick Mars (guitars), Nikki Sixx (bass) and Tommy Lee (drums)—has commandeered the rock pantheon for over 30 years. In that time, they have accumulated worldwide album sales exceeding 80 million, seven platinum or multi-platinum albums, 22 Top 40 mainstream rock hits, six Top 20 pop singles, a star on the Hollywood Walk of Fame, three Grammy nominations, four New York Times bestsellers (including the band’s biography, THE DIRT) and countless sold out tours across the globe, playing to millions of fans. Mötley Crüe was the first rock band in history to have completed an epic sold-out Las Vegas residency at The Joint at Hard Rock Hotel & Casino. The band continues to remain on the forefront of entertainment reinventing themselves via not only their music but also their mind blowing live shows featuring never seen before elements, such as Tommy Lee’s drum roller coaster. Mötley Crüe was featured in KIA MOTORS’ award winning 2012 Super Bowl commercial and their music was used extensively in Dodge’s 2014 Challenger and Charger ad campaigns. About Alice Cooper Alice Cooper is a true rock icon, having pioneered the use of theatrics and shocking images onstage in concerts from the earliest days of the original band of the same name. These European shows will include his 15th performance at London's legendary Wembley Arena since 1972, and mark 40 years since he brought his historic "Welcome To My Nightmare" show there in 1975. Inducted into the Rock N Roll Hall of Fame in 2011, Alice has toured and recorded continuously, with his most recent album being Welcome 2 My Nightmare. Alice's catalog of hits and anthems, including "I'm Eighteen," "No More Mr Nice Guy," School's Out," "Elected," "Poison," and others, are included in his live show. Currently, Alice's touring band features the three guitar attack of Nita Strauss, Tommy Henriksen and Ryan Roxie, backed by bassist Chuck Garric and drummer Glen Sobel. Additionally, "Nights With Alice Cooper," Alice’s nightly radio show, is available in nearly 100 cities in the USA, Canada, Australia, and the UK. The show features his favorite classic rock songs along with his insider anecdotes about many of the artists.